Twice a week, we take our children and staff out on a great adventure into the woods! Forest school was originally conceived early in the 1900’s in response to the increasing urbanisation to combat a condition increasingly referred to as “Nature Deficit Disorder” where everyday behaviour in both adults and children was drastically altered by lack of contact with nature. Forest school is designed to ensure that children always have access to nature from their earliest years. Whatever the weather (excepting the most extreme weather conditions) we encourage the children to play, explore and learn in the forest’s natural environment and encourage a connection to nature through playing with toys made out of objects found in the natural environment. Our Forest School method is a unique way of building, self-esteem, independence and a positive attitude towards learning, as children explore and experience the natural world. Our role as teachers is to assist their play rather than to lead and we allow the children to play and explore at random within our designated forest school area. 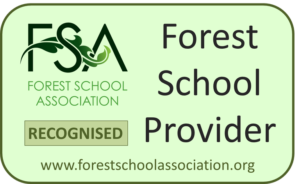 Through our extensive and combined experience as Forest School Teachers, we have observed the many beneficial effects that regular forest school sessions have on our toddlers and young children. “Play Pretend” – We do not bring commercial toys to our forest school sessions and so our children have to create toys through imagination. 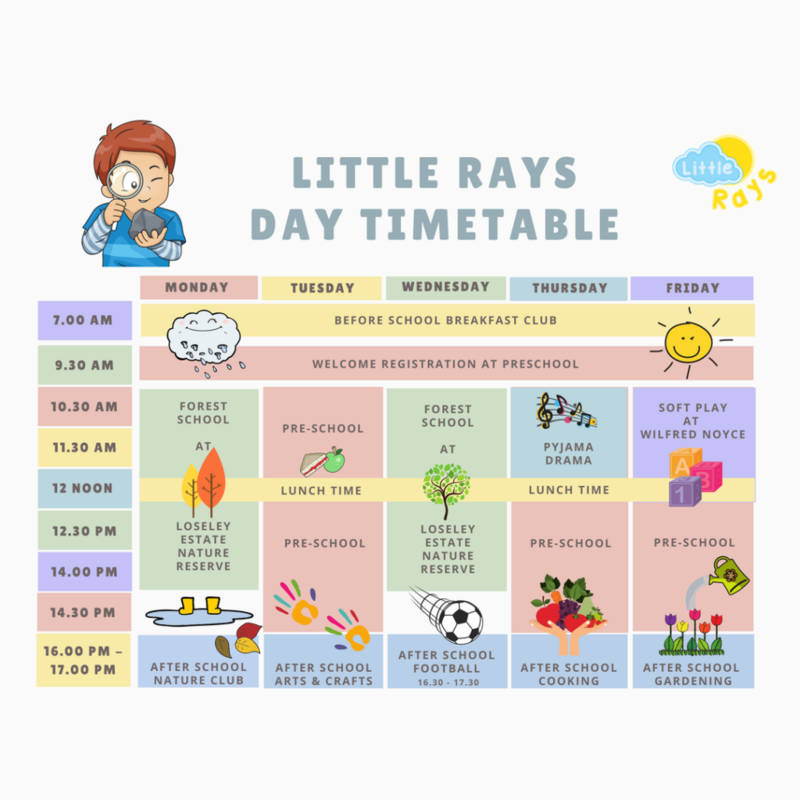 We have seen all our children improve language and social interaction skills through this task as the children verbally need to communicate to their friends what their toy is in order to play their games. e.g. a stick becomes a sward, a leaf becomes a hat, and so on. This in turn also encourages team work and helps to develop their self awareness and individuality. “Say it Loud!” – The forest is a very pleasantly noisy place full of creaks, snaps and rustling noises. Children love being outdoors because they can scream and shout as loud as they like for as long as they want. e.g. Roar like a lion. We actively encourage them to use their voices and exercise their strength by being as loud and noisy as possible. This has been proved to lower stress levels both in children and teachers alike! We also advise parents to try this too! “Walk the Line” – Through playing in the woods, and building dens, etc. We’ve seen improvements in our children’s balance and agility, manual dexterity, physical coordination, tactile sensitivity, and depth perception. According to studies, children who attend forest school experience fewer injuries due to accidents, are less likely to injure themselves in a fall and have the improved ability to assess risks e.g. handling fire and dangerous tools. “Focus” – We’ve seen that being in nature helps to improve our children’s attention spans as they listen to our teachers when they are told to stop when sensing danger, play nicely when games get a little too boystrous, and to come back to ‘base’ and ‘wash up’ when asked. This has also translated into the class room and activities by improving their willingness to focus and interact during arts and crafts activities, follow instructions dancing and singing, paying attention during story time, learning numbers, letters and many other areas. “Health” – According to studies, and through our own observations, we have noticed that playing outside has improved the overall health of the group. Regular fresh air and exercise over the winter months has helped to combat the spread of colds and flus, and allows their immune systems to be exposed to the wider influences that helps strengthen them. We start the day by doing the register and getting ready to go outside. We insist on parents providing forest and weather appropriate clothing according to the seasons. Wellies, waterproofs, fleeces, sun lotion etc. We also pack everyone’s lunch boxes, and provide each child with a florescent vest. We then travel using our school bus and cars to our woods located at the Loseley Estate Nature Reserve near the Watts Gallery in Compton. On arrival at our forest location we form a Catapillar line behind a teacher, and hold our “forest buddy’s” hand. The group then walks through the woods to our base location where we sit at the circle of logs to catch up with what happened at the last session, and discuss our plans what to do this session. The children are free to choose amongst many activities, some introduced by the leader but many are child initiated. Children learn to use hand tools under the supervision of a teacher to help them with existing projects for example use a saw to cut wood for a shelter, making items from wood – a mallet, coasters etc. These activities can be simple or take many weeks to complete. After a few sessions a campfire will be lit to heat water for a hot drink and to cook some food, but all children will have to show how responsible they are while sitting in the log circle before this happens.